This traditional style, family friendly villa is set on a large corner plot in the lower part of Los Mojone, but very close to all amenities. It has been modernised in recent years but still retains a Canarian feel. The covered fenced terrace has patio furniture and a safety gate. This now makes the terrace a safe area with space for young children to play and parents to relax in the shade away from the pool. The pool area is fully enclosed with a high wall and has plenty of room for sunbathing. There is a door from the lounge, which has a large TV and Play Station 2 (please bring own games), out to the covered terrace. The villa has free WiFi. Cot and high chair are also free. 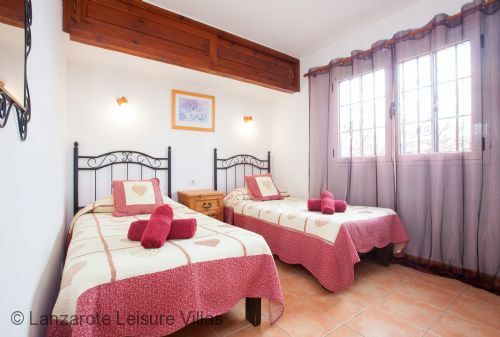 The villa is unusual in having one bedroom with en-suite bathroom set away from the other two bedrooms and the family bathroom – ideal when two couples are occupying or when grandparents want to be away from the children. 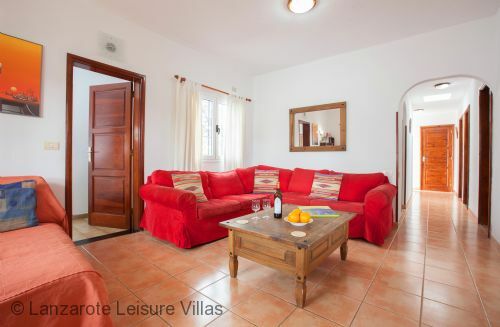 This traditional villa has modern facilities but maintains a traditional Canarian feel and is perfect for a relaxing holiday for families or couples. We have been renting out Casa Gegore on behalf of it's owners since 2004. We had a lovely time, thank you. The weather was glorious if anything a bit too hot. Harry looked after us and the pool very well as usual. Looking forward to returning in February and thanks once again for another lovely holiday. Firstly can I thank you for all the great communications throughout the booking process, made things very simple for us and all our queries were dealt with very efficiently. The Villa was perfect for us. We were a party of 7 and found everything we needed on site – from water, milk and teabags when we arrived to beach towels provided for the pool. The villa was spotless and well maintained. The pool was larger than we were expecting and was kept clean by the pool man who visited twice during our stay. The location was excellent as we were only 5 minute walk from the main shopping centre and 3 minute walk from Lidl. We had all the comforts from home – dishwasher, washing machine, satellite TV and we also made use of the BBQ outside. We were also looked in on by the villa managers to check all was ok after we arrived and before we left. All in all I would give this villa a 5 star rating. The villa was great. The Sky TV was working properly the bed had been moved (as requested) and all was in great working order. Thanks so very much – I will be in touch in regards to next year. In addition, Omnicars were so good and very helpful, I have written a good review for them on Facebook. Everything was perfect as we expected it should be. The fact that we already booked for next year says it all  Thanks again for the perfect villa and service. The extra service that we could check out later than 10h00 was highly appreciated! Just to say we had a lovely time thank you! We knew from experience that it is difficult to capture every detail of a property in 2 dimensional images but when we arrived at Casa Gegore we had a lovely surprise; it is so much nicer than we expected from the pictures. We found that the pool was easily the largest that we have enjoyed in Lanzarote, one in which it is possible to swim properly from one end to the other rather than just take a cooling dip. The inside of the property is comfortably furnished, although apart from sleeping and washing we spent precious little time inside. That was mainly because there is a very large covered area overlooking the pool, but which is securely gated off to ensure safety for toddlers should they be staying with you, which is accessed directly from the lounge. The table would easily seat several adults in comfort for meals and the chairs offer a relaxing seat for those preferring some respite from the Sun even when not eating. There is a sofa for the afternoon siesta in the shade as well. The built-in barbeque is in the corner of this area meaning that a sudden shower doesn't curtail cooking! The area is also very sheltered from any winds that can spring up on the island. We spent most of our time in this area, although there is also more than enough space outside by the pool, with a good supply of sunbeds for those determined to acquire a tan. The kitchen is equipped with everything you might expect from a self-catering property, although we did notice an absence of small kitchen knives for use in preparing food, a small niggle that the management have promised to address by replacing those which have obviously gone astray. 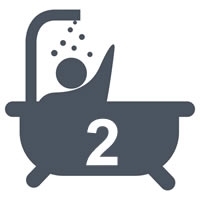 The two bathrooms are clean and functional, although elderly or less mobile guests should be aware that they both have over-bath showers rather than shower cubicles which they might find more difficult. We had no problem with them. The property is in an ideal location being just a 5 minute, almost level walk to the large Lidl supermarket at the end of the road, in which we did the majority of our food shopping; the prices are very reasonable and if you wish to do a large shop in one go the checkout staff will arrange a taxi to pick you up to save struggling with heavy bags. It is also a ten minute walk to the Large Spar supermarket and 15 minutes downhill to the many restaurants in the old port. It was a fabulous holiday and we will certainly be back to Casa Gegore! We stayed in the villa in august to celebrate our pearl wedding along with our 2 sons 22,23 and our sons girlfriend,landed at 10.15 and in the pool for 11 and what a fantastic pool .we have hired villas for many years and this is by far the best pool and outside space .Kitchen was fab and had EVERYTHING you need home from home,shops and end of road took 5 mins to get to ,would be a good idea to have a couple of shopping trolley things in villa as uphill walk with groceries is a pain . We would not hesitate to book this villa again ,also Erika is so quick to sort out any niggles you may have . Just wanted to thank you for both villas we had an excellent holiday with fantastic weather! Just wanted to give you some feedback on both villas. Casa Gegore was so much better than we expected we only ever intended it to be a stop gap before Carrida but we loved it and were sorry to leave! The pool and outside area was amazing and we found the lounge really homely and comfortable! The internet was excellent and the management company dealt really quickly with a couple of tiny issues and we met the owners who were lovely and so helpful! My only small criticism is that all the markings are worn away on the cooker and it was very difficult to work out which setting was the oven/ grill etc but we had an amazing time and actually found the location better than expected and would certainly return to that area it was a lovely walk down to restaurants and bars and we just got cheap taxis back! Carrida has really changed since we were there five years ago and is very bright with the air conditioning an excellent addition! The kitchen and utility area are lovely and so easy to use! We were slightly unlucky that the villa opposite was having a lot of work done on it so was not as quiet as usual! I did mention to Erika the only criticism I had was that the internet television is excellent when it works!!! Unfortunately we had two whole days when it didn't work at all( not a villa problem as local pubs had same issues) and really felt the villa needed a DVD player to give an alternative when the television doesn't work as there are no other channels except through internet! The other strange thing was the master bedroom not having a lock on the door? In all my years of villa rental I have never had a master bedroom without a lock and with much older children felt we didn't have any privacy! We still like the location of Carrida and it is beautifully decorated throughout but having done two villas I think we probably slightly preferred Gegore and I never thought I would say that!!! Thank you for all your help in booking etc the transition from one villa to the other was painless and Erika showed us Cielo( which is amazing) and the pool extension and updates to Benedict since we last stayed there which is an amazing transformation! We will definitely be back in contact the next time we decide to go to Lanzarote! This was by far one of the nicest places that I have stayed in in Lanzarote. Very spacious and clean, I did not see one cockroach, and perfect for a couple with small child to stay with grandparents without encroaching on each other’s space. Great functioning BBQ, fantastic outdoor space for our 2 year old to run around and gated off from the pool. Pool, though not heated in June, still very warm. Great to have the dishwasher and washing machine, both easy to use. Bed in Master Bedroom extremely comfortable. Would definitely stay again ... could do with two keys to property when 2 plus couples staying as the key holder outside was a little hard to open ... would defo stay again. Loved that a lady turned up to order us a taxi, and that Mum and Dad could stay late due to their flight being later. Great service, one of the best holidays we have ever had. Thank you. We all thoroughly enjoyed our week at Casa Gegore. The villa was spotless and, apart from the master bed mattress being very hard and lumpy, very comfortable. The only other downside was a 'musty' smell in the bedroom opposite the kitchen which the management company thought was due to the bedroom being closed up. Said management company and airport transfer company were excellent and super efficient. It was the first villa holiday for my co-travellers and they were very impressed! Management response: Dear Mrs T, Thank you very much for your feedback. I'm pleased to report that a new mattress has been bought, Andrea. A convenient and comfortable place to stay. Nice location not too far from the beach or the old town. Ten minute walk to each and a five minute walk to supermarkets. Great property in a lovely area. We were a party of 4 adults and 3 children (2 teenagers, 1 baby), and there was plenty of room for all of us. The outside area is brilliant with a large covered patio and plenty of sunbathing space around the pool. Lots of sun loungers all within the walled pool area which is very private. We were greeted later in the day of arrival to ask if all ok and point out a few things, also given details for contact should we have any problems (we didn't). Plenty of supermarkets in the area, Lidl is the nearest and cheapest but if you prefer branded products these are available in the other supermarkets nearby. Plenty of lovely restaurants in the resort which we found very reasonably priced. Had a great holiday. Casa Gegore is a very comfortable villa, home from home, in a quiet location yet is within easy walking distance of shops and restaurants. 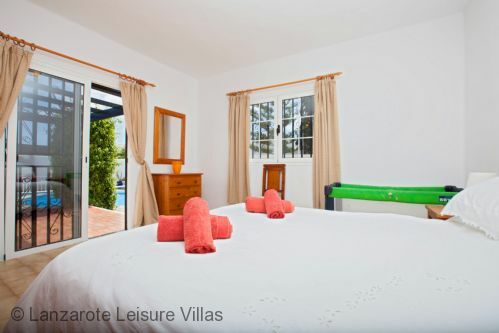 The villa has a large pool which is great to swim in and is maintained to a high standard. The master bedroom is spacious and airy with a kingsize bed and large en-suite bathroom. There are also two twn bedded rooms and a family bathroom. It has a large covered terrace which is lovely to sit out in, overlooking the pool. 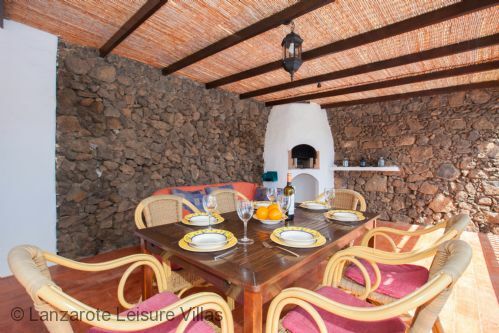 Lanzarote Leisure Villas are a family run company who really understand the island and their clients'. You can totally relax while in their care as you know that if something needs attention during your stay as for example things do break down from time to time it will be sorted out without any hassle. My husband and I have been using them for many years and enjoyed a selection of different villas during that time. We have already re-booked for April and September next year. "spacious relaxing holiday before/after Ironman Lanzarote"
Are you looking for a spacious place where 3 persons/couples could stay in private/together on Lanzarote ? Well, then this is it! I have been able to focus on my race before and relaxing after in perfect accomodation. Very clean and well equipped villa where I would come back if it is free. New kitchen, Only reason why I don't give 5 stars: showers in both bathrooms are rather basic for this villa. 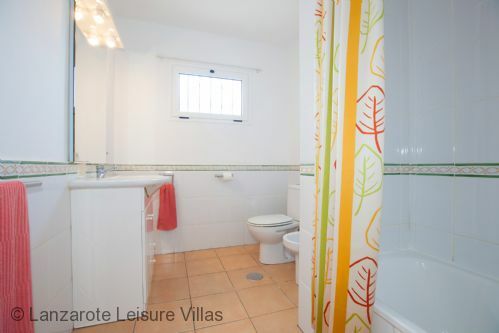 "Fabulous Villa in a great location." We had a fantastic holiday in Casa Gegore. From the first time you turn the key in the door until the day when you reluctantly have to leave, this villa just feels so welcoming and comfortable. It is situated in a quite side street in Los Mojones, just a 15 minute walk to the beachfront or the harbour. The three bedrooms are spacious and have plenty of storage space. The Master bedroom is fantastic with a large ensuite and a sliding door out to the terrace. The bed was very comfortable, had great nights sleep which is sometimes rare on holidays. The kitchen is very well equipped and spotlessly clean. The welcome pack which includes bottled water, orange juice, milk as well as tea & coffee is much appreciated, especially when you arrive late evening. There is plenty of outside space with lots of sunbeds around the pool and a large covered terrace with a dining table/chairs and comfortable wicker couch (great for that afternoon nap after a lunch of Tapas and wine down in the old Town, overlooking the Harbour ). 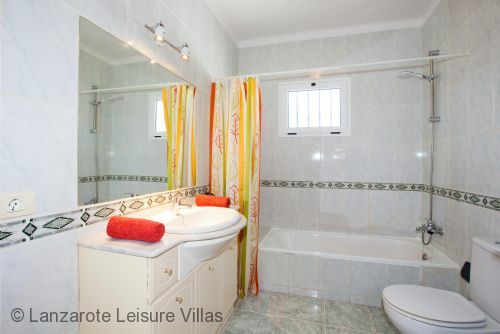 We booked this Villa with Sue at Lanzarote Leisure Villas and as always it was a pleasure dealing with her. The advice she gives us is always helpful and accurate even down to the strength of the wifi, which in Casa Gegore is very good. We are looking forward to going back to this Villa in the near future and would recommend it to anyone who wants a great holiday in peaceful surroundings with all the comforts of home. Family of 4 and we had a lovely week at Casa Gegore - the villa was very well placed for all the amenities of Puerto del Carmen, and we particularly enjoyed the heated swimming pool and the outside sitting area. 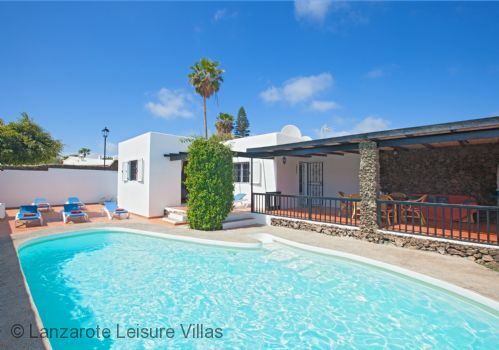 Property was clean and owner/agent responded quickly to a couple of concerns we had - we would use Lanzarote Leisure villas again and would recommend them to family and friends. We very much enjoyed walking to Puerto Calero, dining there and getting the water taxi back, El Poril and Puerto Bahia restaurants in Puerto del Carmen, and were pleased with the proximity/easy walking distance to a supermarket and a shopping centre. 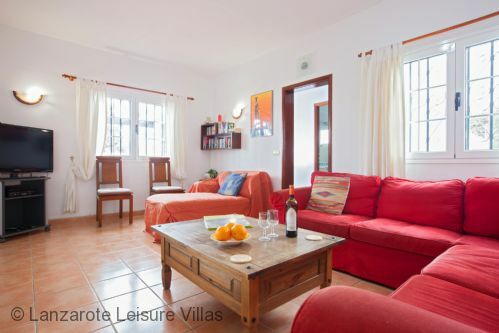 We are regular villa holidaymakers in Lanzarote, always through the excellent services of Lanzarote Leisure Villas. We have now stayed in Casa Gegore several times and are impressed with all aspects of the villa. It is well equipped, has spacious accommodation, large private pool and large alfresco dining area. It is in Los Majones, Peurto del Carman and is walking distance from the beach boulevard with many shops and restaurants and, in the opposite direction, the port/marina with many restaurants serving lovely food and with beautiful sea views. This villa is suitable for couples and families and you have the choice of cooking/eating in or dining out. If you wish to hire a car the location is good touring the island. If your are more adventurous there is an excellent bus service. We cannot speak highly enough of the villa, location and agent. "An ideal holiday location for all the family"
Casa Gegore is a typical canarian bungalow which offers an ideal location and facilities for all members of the family.It has a lovely pool area with plenty sunbathing area but the highlight of the villa is an outside covered terrace area which serves as an extra room giving shelter from the sun but still full access to the family in and around the pool.The location of the villa gives easy access to the harbour area of Puerto del Carmen and the beach area along the strip.The service given by Lanzarote Leisure villas is excellent both during the booking and support whilst in the villa itself. We absolutely loved this villa and spent two sunny weeks here over the Christmas period. We especially loved the outside covered terrace and my husband spent most of his time there, catching the sun, reading and sleeping! There was plenty of sunny spots around the pool and it was totally private. The villa itself was well equipped and comfortable, and we particularly liked the fact that the master bedroom was separate from the other bedrooms. 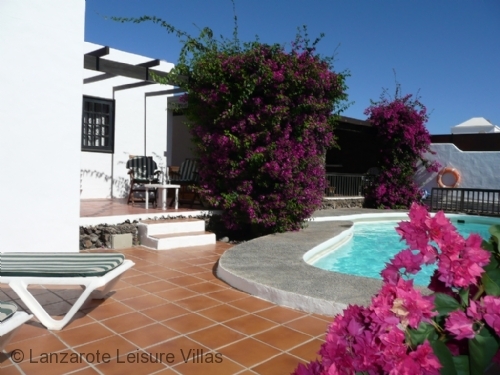 All in all this is a great villa and we'd certainly book it again through Sue at Lanzarote Leisure Villas! We stayed at Casa Gegore and it was truly brilliant. There were 5 adults 2 children and 1 baby. We all found it very well equipped and suitable for our needs with two separate sleeping areas. It was fully furnished with baby cot, high chair and a very baby friendly terrace - ultra safe with a safety locking gate. Excellent for parents. Super pool with plenty of room for sunbathing and enjoying the Lanzarote sunshine. Would definitely recommend this villa to other families and would stay there again. Thank you so much for a lovely holiday. Very child friendly....great large, gated covered patio and pool had wide steps into the water. Large sun terrace too....best of both worlds. Well equipped with good sized rooms. A beautiful villa, would love to visit again!!! 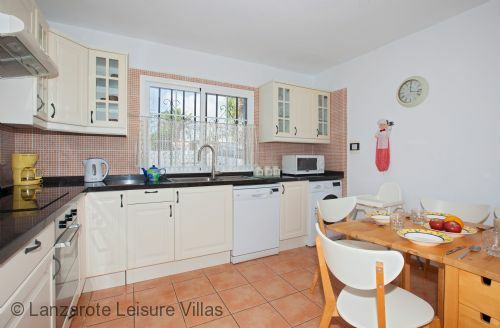 Casa Gegore is in the Los Mojones residential area of quality villas and a part of Puerto Del Carmen’s old town. This quiet part of Puerto del Carment has a large range of individual villas spread over quite a large area. 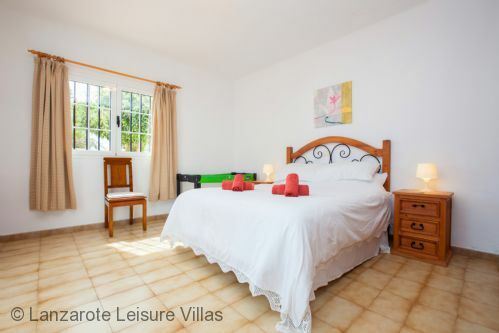 This villa is located in the lower part of Los Mojones, which is quite important when going out. Some villas rented in this area can be a good 10 minutes further back from the amenities. Supermarket: 5 minute walk (400m) east to Lidl at No. 1, Calle Juan Carlos I. A large well-stocked supermarket with a great meat counter for your BBQ. When paying just ask a staff member to call a taxi for you and they will happily do so. Local restaurants/ bars: 5 minute walk (400m) east to Calle Juan Carlos I. Shopping: Biofera Shopping Plaza, 6-8 minute walk (550m) south-east to No. 15, Calle Juan Carlos I. Four floors of shops, restaurants and amusements including Starlight Open Air cinema playing 2 English movies each evening, a billiard and pool hall, crazy golf, and Cine6D virtual reality motion rides. Harbour: 15-16 minute walk (950m) south - there are a wide choice of restaurants and bars in the harbour area. Great for lunch, dinner or a drink while an adventure playground keeps the children amused. Lots of choice of boat trips from the harbour including trips on a submarine diving down 50m, scuba diving and the water taxi to the marina at Puerto Calero. Beaches: Playa Chica, a 16-18 minute walk (1.1km) south - is a pretty little cove surrounding by volcanic rocks, which is perfect for snorkelling and diving (a dive school is located here). Other sports enjoyed at Playa Chica are parascending, banana boat rides, single and double jet-skiing, Crazy UFO and Fly-boarding. The main beach, Playa Grande, a 16-18 minute walk (1.1km) south-east - is a long stretch of fine grain sand with calm waters, a very gentle shelf and little current so paddling and swimming are very safe. The Main Beach Road: 12 minute walk (750m) south-east to the western end of Avenida de las Playas, the long 'strip' of restaurants, cafes, bars and shops of the greatest variety that runs parallel to Playa Grande. Beach-side, the palm-tree lined promenade is perfect for strolling, jogging, cycling on the red brick cycling lane (many bicycle renting places available), or just people watching. Don’t forget taxi fares are inexpensive in Lanzarote if you don’t want to walk home. Puerto Calero: 50 minute walk (4km) go west along the coastal walkway and you will reach the marina at Puerto Calero, where there are lovely restaurants and gorgeous shopping. This walk is very popular with our clients. The restaurants in Puerto Calero are perfect for a long lazy lunch. The Water Taxi back costs 6 Euros and the last one leaves about 5pm. Golf: Lanzarote Golf - an 18-hole public course, 8 minute drive (2.4km). Markets: every Friday 10am - 4pm 100 stalls set up at the Plaza Varadero near the Old Town harbour for locally sourced fruit, vegetables and flowers, as well as handmade craft items, jewellery and clothes (950m). At nearby Tias, the Saturday morning 9am - 2pm Farmers market is an ideal place to purchase fresh locally produced vegetables much cheaper than the supermarkets (8 minute drive 6km north-east). Also, the biggest open-air street market in Lanzarote is on Sunday mornings 9am - 2pm in Teguise (28 minute drive 21km north-east). Fenced and gated terrace to keep children protected from the pool. Pool has a cover and steps for entry. Cover should be kept on when the pool is not being used for long periods. Overnight is essential as the water temperature can drop as much as 6C degrees. Heating - solar heated in the summer, electrically heated from November to April inclusive. Safe, hairdryer, iron and board. Food pack of tea, coffee, sugar, juice, biscuits, water and milk. If you would like anything additional upon arrival, please request.